I’m so excited to post about this! When I met Dana, I fell in love with the skirt she was wearing. She made it herself (obviously) and she showed us how simply she’d shirred the waistband. The next day, during the mystery workshop at Whipstitch, we were encouraged to use thrifted tees. 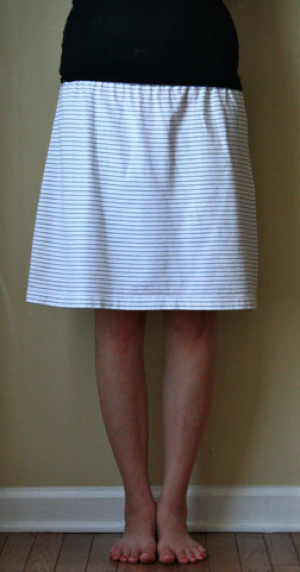 I’m devastatingly terrified of knits so I steered clear and made my (award winning) cotton fabric dress. But I was inspired. I developed an idea in my head I thought just might be crazy enough to work. The next chance I had to steal away alone, I made a beeline for Goodwill. I found exactly what I was looking for, got my purchase for half-price, and excitedly headed home. The Hubs thought I was a little crazy when I explained my idea to him. I measured, cut, and finally, with trepidation, I started sewing. Less than 30 minutes later I was wearing my Shirt Skirt!! That’s right–I made a skirt for myself from a man’s tshirt!! A shirt skirt! It’s the easiest thing in the world to do! And I just can’t stop making them. The shirt skirt perfect for summertime. They’re perfect for when you’re pregnant, they’re perfect for after you have the baby. They’re perfect if you change size or shape or hate your clothes. They’re just simply PERFECT. Comfortable, casual, and cheap. I wore the green and white one to Sofie’s birthday party. And the navy blue one to a casual family wedding. I made 2 others for a cousin. I had 2 women in Walmart stop me to tell me how comfy my skirt looked and when I told them how I made it, they demanded I call Rachael Ray immediately! The process is so easy. I can whip one of these up in less than 30 minutes. Wanna make some of your own? GREAT! Here’s how I do it. I do my shopping at Goodwill for 1 reason. Their tshirts are $2.09. But they tag everything with a colored tag and every week a different color is half price. So I usually seek out shirts that are the weekly color to score them for $1.05! 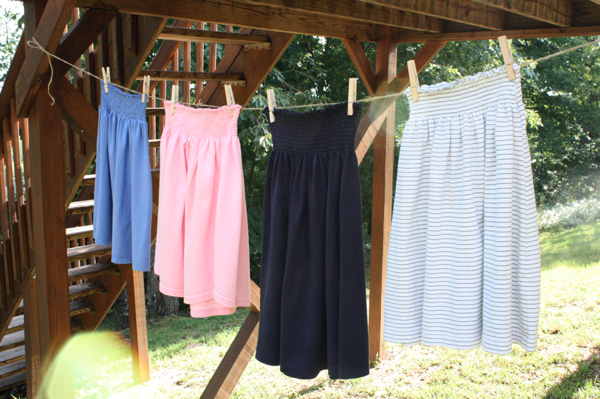 So those skirts on my clothesline? Cost me $4.20 total to buy. Even if I find a shirt I have to have, it’s $2. You can’t go wrong for $2!! So, get your super cheap thrifted shirt. The bigger you buy it, the better. The green and light blue shirts were large size Large’s. The Navy blue was a Tall XL, and the pink shirt was a 3XL! It’s hard to find them with stripes, so I’m always drawn to those first. If you really want a pattern, check out the polos. They’re more expensive, but if you get them half price, they’re still in the $2-$3 range. As with anything you get second hand, check it out to make sure it’s not faded, full of holes, or stained. I like to wash mine before I begin sewing. To determine what shirt size you should get, just make sure it will go around you. Most of the shirts I use are at least 24″ across (so 48″ total diameter). You lose 2-3 inches after you shirr it, so take that into consideration. Like I said, the bigger the better! So, lay your shirt out flat, and whack it off right under the sleeves. (see my red tag on the left sleeve?) This doesn’t need to be perfect. That’s the beauty of this skirt. No measuring, no perfection. Wing it–you won’t be disappointed! But don’t throw away the top half of the shirt yet. I’ve got other projects for those parts! I like to use thread the same color as my fabric. You don’t notice sewing boo-boos so much if the thread blends in. 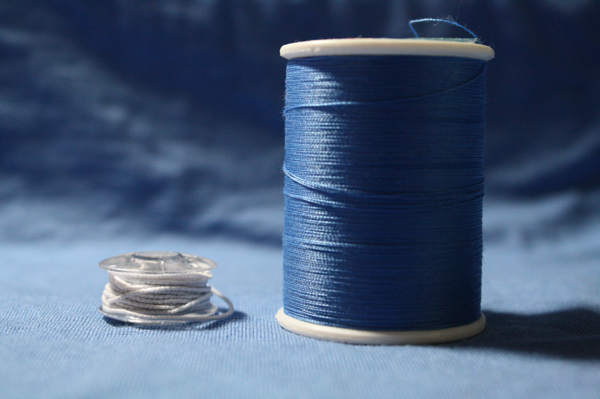 But if you’re gutsy enough, use a contrasting thread! You’ll also need an elastic bobbin so your skirt will shirr. **If you don’t know how to shirr, check out some online tutorials or videos. It’s VERY easy! I was highly intimidated by it at first, but I urge you not to be! A great place to start is Sandi Henderson’s tutorial. 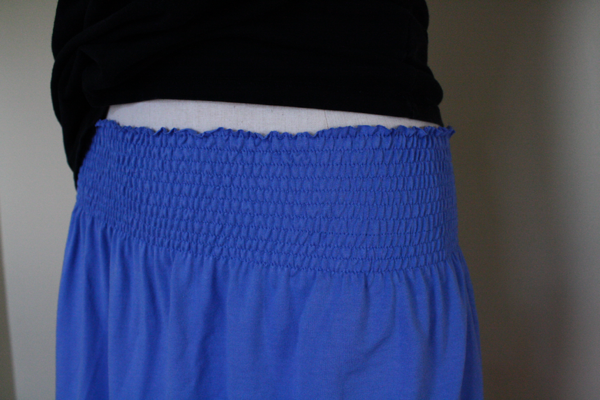 You want to start close to the edge so you don’t have a huge ruffly waist band. There’s no need to hem the top band, your knit shirt won’t fray. I like my first row of stitching to be 1/8th of an inch from the top of the skirt. So I line my fabric up with the edge of my presser foot and put my needle in the right position. Now, I break a rule of shirring. Instructions will tell you to leave your threads and tie them. Well, I threw that rule out the window 6 skirts and 2 dresses ago! 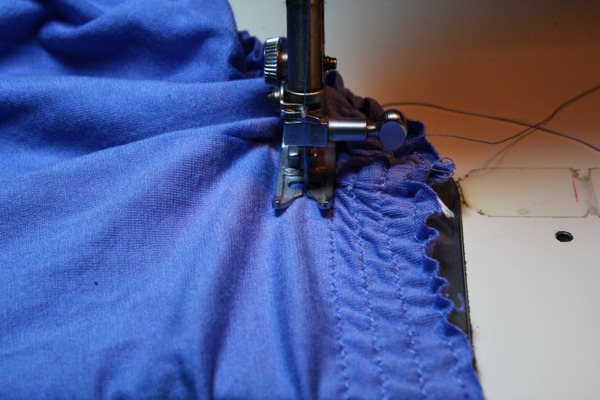 When I start sewing, I back stitch a few stitches, then sew all the way around the skirt. When I get back to my starting point, I back stitch twice (so back 3-4 stitches, forward 3, back 3, forward 3) then leave my elastic ends about 1/4″ long. And what it looks like on the outside. It doesn’t stick out or look funny at all when you wear it. It’s not even noticeable until it’s pointed out. 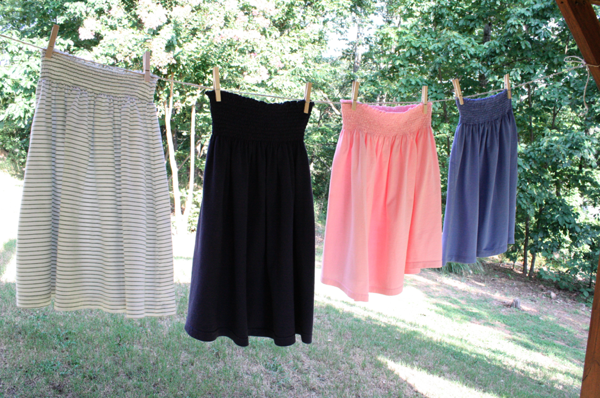 I’ve washed the navy and green skirts about 10 times each and the elastic hasn’t budged. So break tradition and save yourself some time! There’s no need to mark your rows. Just use the edge of your presser foot as your guide as you sew. I like to put my needle in the left position, but my machine doesn’t like that lately. 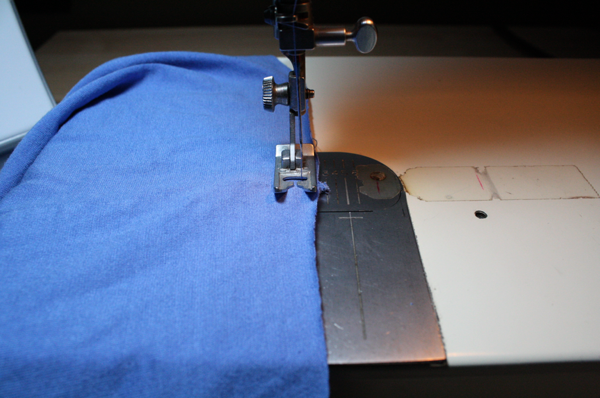 Sewing at 1/4″ rows with the needle in the middle turns out just fine so that’s what I do 95% of the time. Unlike 100% cotton that doesn’t shrink much as you sew, knit shrinks up LOTS. So you need to make sure you pull the shirt flat as you sew. Use medium pressure when you pull. You don’t want to work against your machine, so don’t pull hard. 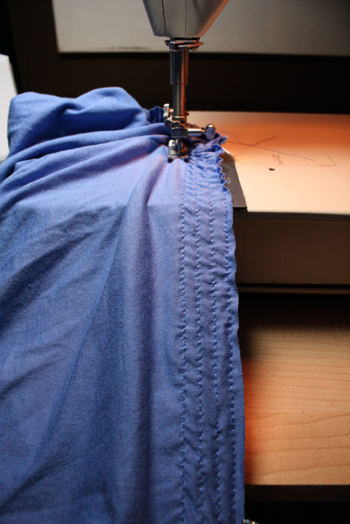 Do it in small sections to maintain control over where you’re sewing. **If your shirt isn’t shrinking up as your shirr, you’ll need to adjust your thread tension. Experiment on scrap pieces from your shirt until you get it to shirr properly. When you get back to the start, hold the fabric open and flat while you do your back stitching. Just keep sewing as many rows as you want! I do somewhere in the neighborhood of 12-15, depends on my mood and the length of the skirt. I generally need to use 2-3 elastic bobbins, so you might want to wind several before you start sewing to save yourself the hassle. Check your bobbin between rows to make sure you have enough to get back around. It’s okay if you don’t, just back stitch a few times with the new one and keep going. It just doesn’t look as tidy that way. And that’s it! 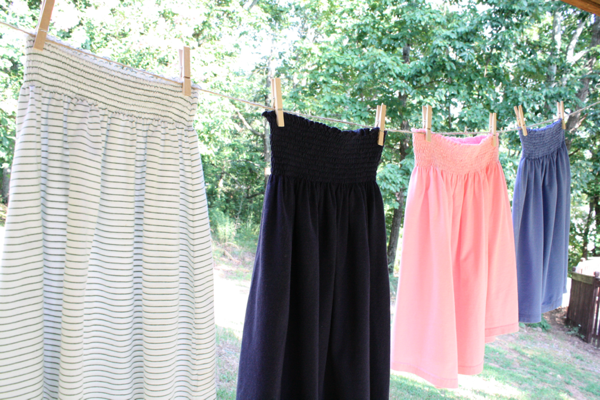 The best summer skirt you’ll ever own! I’ve had a lot of readers submit great questions over the last few months. I wanted to go ahead and address some of them in the post just in case they get missed in the comments. Q: I’m a beginning sewer and this looks like a great easy project. I was wondering how much the waist area decreased after shirring and steaming. For instance if you had a 48″ total circumference on your tshirt, how much would the waist shrink. 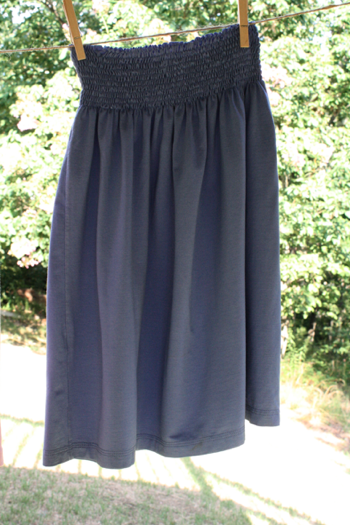 A: My skirts shrank about 2″ after shirring. That’s 2 inches when you stretch the skirt to it’s full capacity. So previous to sewing, it was 24 inches across when laying flat. After shirring and steaming, it was 22 inches. This is generally the XL size. Q: Could this be done with like a polo shirt? and if not, does anyone have any tips on how to turn a polo shirt into a skirt? A: Yes of course! Any knit shirt would work! Polos might be a little tricky because they usually have a split seam at the bottom on each side. So as long as it’s long enough, a polo is a great option, especially because they’re usually the fun colors and prints you can find. Q: How do you find t-shirts that are long enough. Once I cut off the bottom under the arms, it seems SO short. 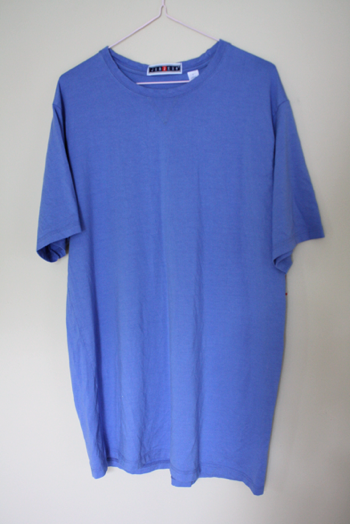 Do you use extra long t-shirts for these? A: Typically, no. If I can find them, it’s always an added bonus. My navy skirt was a long shirt and it’s definitely longer than the other shirts. But generally, the bigger the shirt, the longer it is. So when I use one that’s a 2XL, it’s going to be several inches longer than a big L. To know for sure if I’ll feel comfortable, I hold it up to me with it folded down at the armpits, and measure the length. If it’s too short, I keep looking. Q: I have NEVER heard of a elastic bobbin before, is it sold separately or is it separate stretchy thread that you somehow fill onto a bobbin? A: You buy elastic thread and wind it onto your bobbin by hand. It’s sold in 2 colors, white and black, and can be found (generally) anywhere that sells thread. 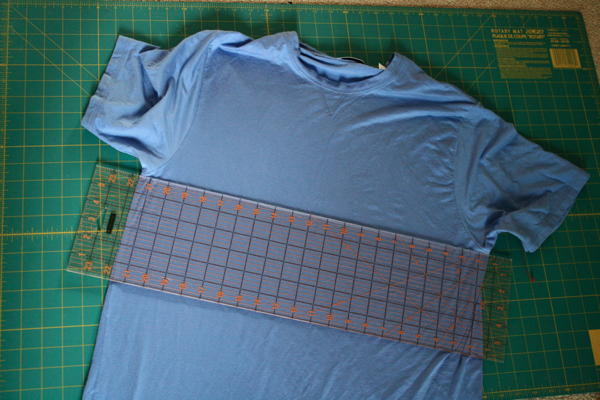 Check out the tutorial on shirring I referenced for more information. Q: Is the elastic thread only used in the bobbin ? Then regular thread used for the top? Also do you stretch the fabric as you go? A: Yes, the elastic is only in the bobbin. You use regular thread on the top. I don’t use special needles either, just the regular ones I use for sewing on cotton. I don’t stretch the fabric, I just keep it flat. As you sew, it’ll shrink up on itself. You want it to stretch, so you need to pull it out to its original size, but not pull it more than that. Q: So what are the other projects you mentioned to use the sleeves you don’t use to make the skirt??? 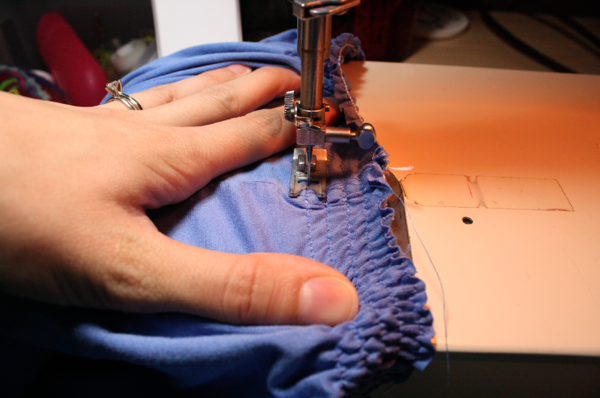 A: I use the neck part to make the Shirt Bibs, and I use the sleeves to make shorts or bloomers. I haven’t posted a tutorial on this, but I did do it in one of my projects during SYTYC. 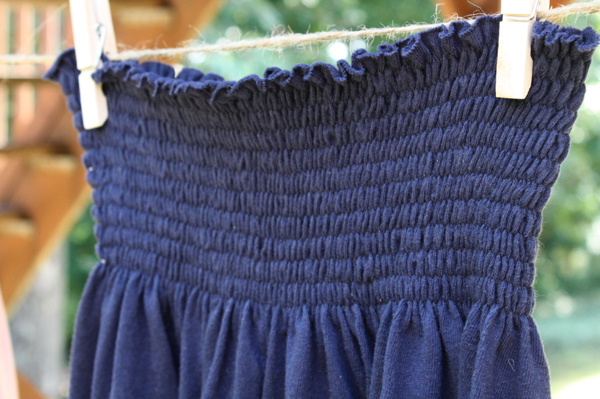 Q: Could you use shirring elastic in a smocking pleater?? Anyone with a pleater tried this? A: I’ve never used a smocking pleater before. You might want to try contacting the manufacturer and asking if it can be done. I’d hate for you to try it and booger something up. Pleaters aren’t cheap! These are cute, but what size are you? What about a plus sized woman? Sure these will look great on a size “nothing” but what about those of us with curves? And I don’t mean pregnant bellies that look like a 16″ softball. What material is the t-shirt supposed to be made of? Cotton? Polyester? I have cotton and the elastic is not tightening. 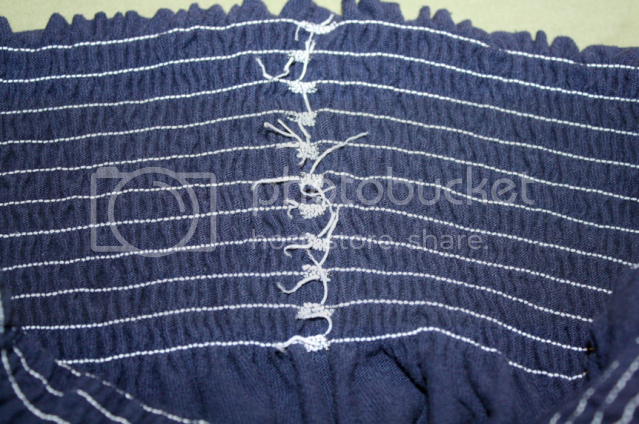 I am having the same problem as Marcie…I made one with a cotton shirt and it did not tighten. I found a place online that told me what to set my tension etc to to shirr, and it tightened a little, but was still way to big for me. What kind of tshirt fabric do you need? I’ve had this tutorial bookmarked for such a long time now and I fiiinally got around to getting elastic thread. It was pretty easy to make! I like that it was so simple and I got such a cute skirt out of it. I definitely want to make more for the summer time! I really want to try a striped one! Caroline, you asked about the sizing. I used an XL shirt. I am a size 14 and it fits me a bit snug but I don’t mind in case it stretches out while I’m wearing it. I may go one size bigger next time. Hope that helps! As I’ve told several before you, unfortunately I think there are some machines that just don’t shirr. It’s not going to make a difference what you do, yours just won’t do it. While at that sewing weekend at Whipstitch, there were several women whose machines wouldn’t put any tension on the elastic no matter what was tried–and several of us tried for a VERY long time! So it just may not be possible for you. Sometimes, depending on the thickness of the material things will shrink more or less, but I never have a problem. It sounds like it just might not work for you. I’m so sorry! Oh bummer, thank you Melissa. I have a brother machine and I found this youtube video http://www.youtube.com/watch?v=vcELEGN9Rrk that said she tried and tried and figured out a way to shirr on it, but maybe not. I will maybe try one more time and play with my tensions more. I’ll let you know if I figure it out! I made one today following your pattern. didnt come out quite right but will work on it. very comfy none the less. I hope you can check it out. I have wanted a sewing machine for as long as I can remember! And I got one 2 months ago for my 30th birthday! I’ve made two of these skirts… took me about 30-40 minutes each… and i am a TOTAL beginner! People can’t believe I made them with so little experience! … yours look much neater than mine – but I LOVE THEM! thank you! For those who can’t shir, I think you could zigzag over the elastic thread and then pull the elastic thread to the desired length. I could be a workaround for you. I can’t get this in my head. Do you sew on the right side or the wrong side, and you don’t measure the elastic, just sew it on flat fabric? And it shrinks up to fit anyone’s size? These are really cute, want to try it! Thanks a lot for that tutorial ! 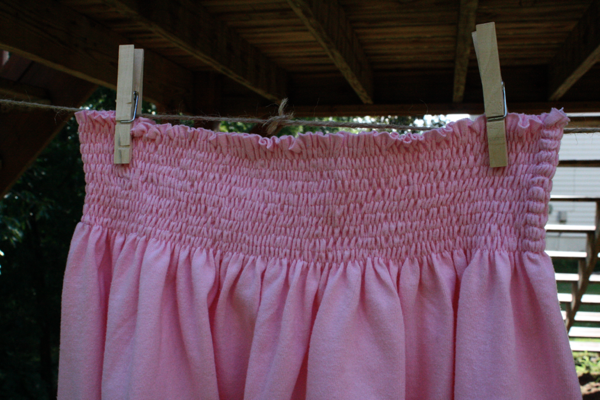 It is so easy to make… I used a women’s shirt to make a little girl skirt, and added some ruffles. You can see pictures on my blog : sewingpot.blogspot.com. Bye ! I love the way these skirts look! I am excited to learn how to shirr also! 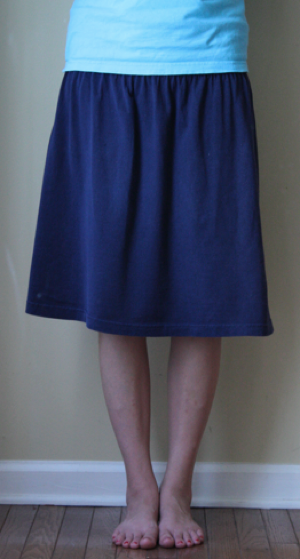 I’ve made a shirred skirt from a sheet, but didn’t think about using a t-shirt. I’ll have to try this soon. I love shirred skirts. They are so comfortable and I bet even more so in a knit! I would like to add a few more line of shirring and use these as cover ups for my littles on the beach.